The Northeast is experiencing a year of low acorn production, in contrast to Michigan, where I found the forest floor layered with sweet acorns. But I was not aware that the variations in acorn production can have an influence on the prevalence of Lyme Disease the next year. Here's how it works. Acorn production normally runs in a series of high and low production years. That's a given. It's what happens when a good year is followed by a lean year that things get interesting for the humans who spend time in the woods. 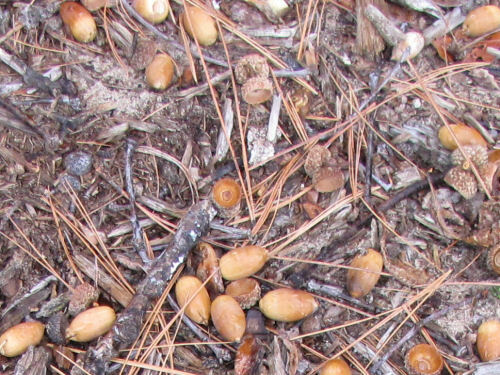 When acorn production is up, the wildlife that depends on the nuts for food flourish, and their populations rise. If a good year is followed by a year of few acorns the large populations of squirrels, mice, and ground-nesting birds will crash, as they will have a hard time finding enough food. Of course, when the wildlife increases, so do the tick populations. And when the wildlife dies off, all those ticks will be looking for fresh blood. Humans in the woods make them very happy. So, if you live in the Northeast, be sure to take your DEET to the woods next spring!